Can 7th–9th graders learn how to be innovators and inventors? Yes, they can! 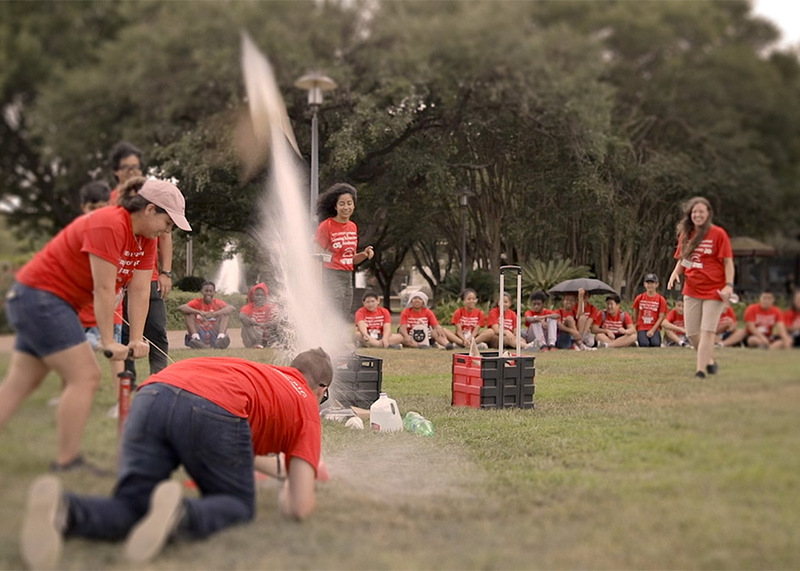 This summer, 28 students attending the Chiyoda Young Innovators’ Academy spent two weeks at the University of Houston learning what it takes to develop an idea, taking it from a concept to an invention. Chiyoda International Corporation provided primary sponsorship of the camp. During the Academy, students participated in an array of design challenges, building parachutes and bottle rockets and reverse engineering common objects, like coffee mugs. They also got involved in programming to create and develop games and learned to use microcontrollers that allowed them to make a robotic finger move. 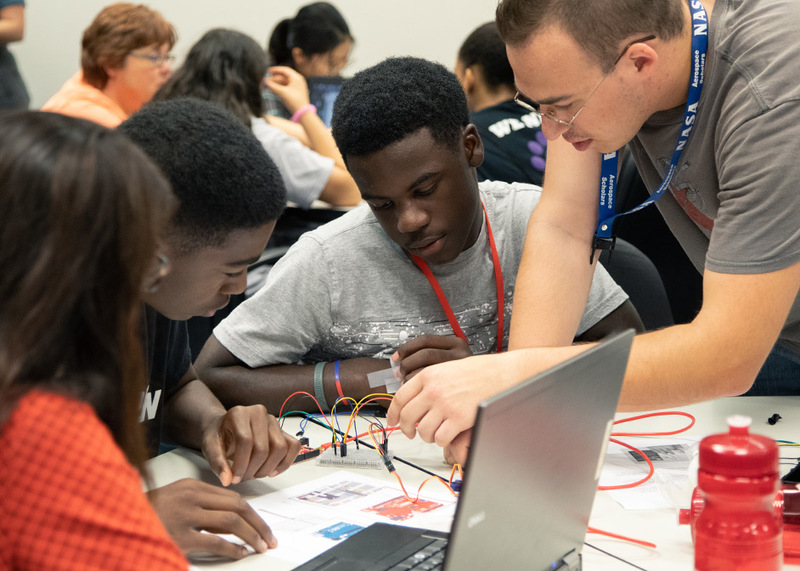 “The programming activities we designed helped bring in cutting-edge experiences in the critical area of computer science,” said Laura Harlow, instructional assistant professor and math master teacher with teachHOUSTON. As students worked on ideas for their products, counselors helped them take a far-out idea, like ‘build a flying car,’ and hone it down to something more practical for a car. “We talked about what scientists and engineers do and how they look for ways to solve problems. We challenged students to look around their homes and find an area of need,” Manuel said. Once students came up with their product idea, they interviewed friends and family, and did a customer needs analysis that helped them further develop their concept. “There was a deliberate focus on problem solving and helping the community by using STEM (science, engineering, mathematics and technology) skills and innovation,” Manuel said. Invention ideas ranged from backpacks with attached umbrellas to childcare, household and kitchen products. Problems faced during Hurricane Harvey resulted in inventions addressing waterproofing of important items and flotation devices for vehicles. UH teachHOUSTON preservice teachers assisted with the academy, facilitating small group discussions, helping with lesson plan ideas and leading lessons. This academy was part of their experience with the Noyce Summer Internship Program. “They were truly cheerleaders and mentors. 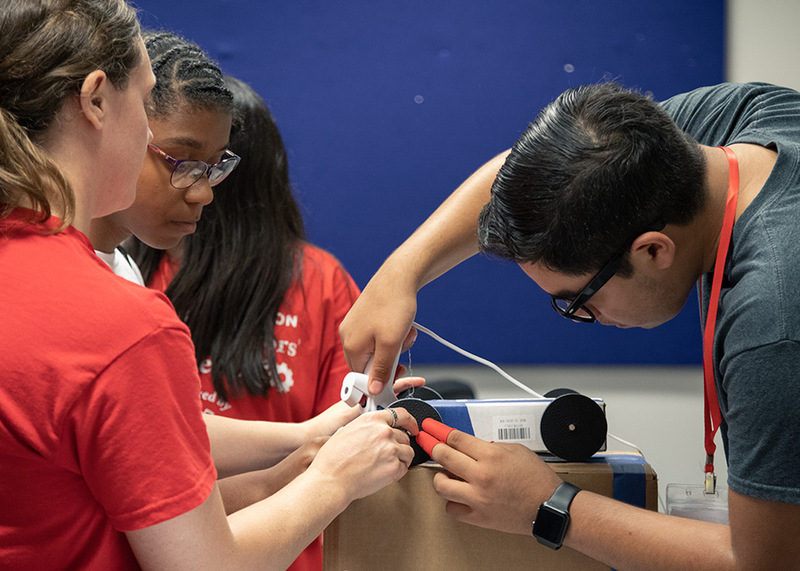 As the kids came up with ideas and sometimes lacked confidence in moving forward, our amazing future STEM teachers were right there to build them up,” Manuel said. teachHOUSTON, a collaboration between UH’s College of Natural Sciences and Mathematics and the College of Education, combats the shortage of qualified STEM teachers in secondary education. Students participate in field-based teaching experiences throughout the four years they are working on a bachelor’s degree in science or math, as well as a teaching certificate. Chiyoda International Corporation is an engineering and construction services company experienced in the design of petroleum refining, gas processing and petrochemicals plants. They sponsored this endeavor by providing $15,000 in funding for the academy. Chiyoda employees took an active role during academy activities. “Their financial support allowed us to give out multiple full and partial scholarships to students coming from high-need areas,” Manuel said. “We at Chiyoda are so proud of all the students who participated in the summer academy. We hope the students can build on this experience as they move forward in their studies, and hopefully, enter STEM-related careers in the future,” said Tomoaki Ishikawa, treasurer and CFO, Chiyoda International Corporation. Chiyoda employees served as guest speakers, telling students about the work they do and the types of problems the company is solving. They also met with the various product teams and provided students with their expertise and suggestions on designs. On the last day of the academy, Chiyoda employees served as judges at the Young Inventors’ Showcase, which was hosted in partnership with the Inventors Association of America-Houston Chapter. Over the two weeks, instructors working with the academy saw a dramatic change in the students. At first, some students were a bit shy about presenting in front of the group each day.